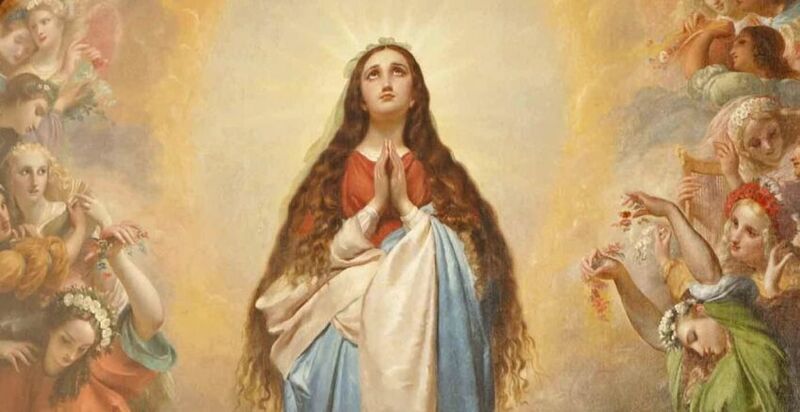 Today is a Holy Day of Obligation in the United States, a day on which we celebrate the Immaculate Conception of the Virgin Mary (the Immaculate Conception has been, since 1846, the Patroness of the United States). Note that it is she, Mary herself, who is the Immaculate Conception; the day does not refer to Mary's conceiving Jesus by the Holy Ghost, but to the conception of Mary in the womb of her mother, St. Anne, by Mary's father, St. Joachim. What makes her conception immaculate is not that she was conceived by the Holy Ghost of a virgin, as was Christ Our Lord, but that from the very moment of her conception, she was filled with grace by God, Who knew, in His omniscience, that she would say "yes" to the Angel Gabriel and become the Mother of the Savior. Exactly nine months from now, on September 8, we will celebrate Mary's birthday. Most of what we know about Mary's parents, SS. Anne and Joachim, is derived from the apocryphal Protoevangelium of St. James and the Gospel of the Nativity of Mary. St. Anne is the patron of childless people, pregnant women, and grandmothers (her Feast Day is 26 July); St. Joachim is the patron of grandfathers. (In the painting above, St. Anne sits in the chair, and her husband stands at her right. Cleophas is seen in the right-hand corner reading, and Jesus, Mary and Joseph are in front). Adam and Eve, Mary and Jesus -- the only four persons with human natures who were, in their first moments, without sin (and, of course, Mary and Jesus remained sinless). Mary is the All Holy, and it had to be this way: Christ took from her His very Flesh and Blood -- the Flesh that was scourged for us, the Blood that was spilt for us, the Bread of Life that saves us! Symbols for the day are any of the usual Marian symbols (the color blue, her crown of 12 stars representing the 12 Tribes of Israel and the 12 Apostles), but especially those which emphasize her purity, such as lilies and her Immaculate Heart. There are no special practices today that I know of, but, as with all Marian Feasts, it is a good day to pray the Magnificat, the Litany of Loreto, the Little Crown of the Blessed Virgin, the Akathistos Hymn to the Theotokos, the Ave Maris Stella (Hail, Star of the Ocean), the Glorious Mysteries of the Rosary, etc. The Epistle reading today will be from Proverbs 8:23-25, the Gradual will be Judith 13:23, the Tract will be Psalm 86:1, and the Gospel will be Luke 1:26-28.
this statue, as a perpetual memorial.